For many years, there was a split of authority in the Second Circuit as to whether an employee who was wrongfully denied minimum wage and/or overtime compensation could collect liquidated damages in New York under two laws – the Fair Labor Standards Act (“FLSA”) and the New York Labor Law (“NYLL”) – for the same misconduct. It’s important to speak with a labor law attorney NYC to properly assess and determine all of your legal rights. In the employment law context, liquidated damages are a fixed amount of money defined by statute for employees who were denied minimum wage and/or overtime compensation. 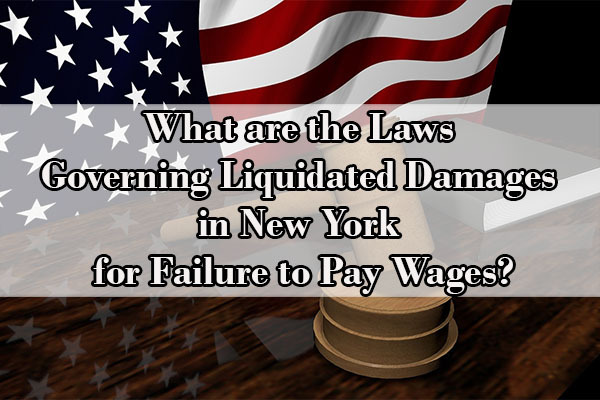 What are the Laws Governing Liquidated Damages in New York for Failure to Pay Wages? Both the FLSA and the NYLL provide for an award of liquidated damages that is equal to the amount the employee is owed in unpaid wages. In other words, if an employer violates the FLSA and/or the NYLL, the employee can recover not only his unpaid wages, but also liquidated damages in an amount equal to the amount of unpaid wages. The issue that inevitably arose was whether an employee can “stack” liquidated damages under the FLSA and the NYLL so that the employee receives a triple recovery – unpaid wages, liquidated damages under the FLSA, and liquidated damages under the NYLL. Many courts in the Second Circuit had granted employees liquidated damages under both statutes because those courts found that liquidated damages under the FLSA served a different purpose than liquidated damages under the NYLL. However, other courts in the Second Circuit had refused to award liquidated damages under both statutes. Prior to 2009, under the NYLL, an employee bore the burden to demonstrate the employer’s willful failure to pay wages, and upon establishing this, the employee could be awarded as liquidated damages an amount up to 25% of the total amount of wages due. But in 2009, the liquidated damages provision was amended to bring it more closely in line with the FLSA. The burden was shifted to the employer to prove a good faith basis to believe that its underpayment of wages was in compliance with the law in order to avoid liquidated damages. Then, on April 9, 2011, the New York Wage Theft Prevention Act (“WTPA”) went into effect and increased liquidated damages for violations of the NYLL from 25 percent of the underlying unpaid wages to 100 percent of the unpaid wages and made liquidated damages virtually automatic unless the employer could prove that it acted in good faith. In our previous blog post from February 7, 2017, we already mentioned that the Second Circuit Court of Appeals held that plaintiffs bringing claims for unpaid wages under both the NYLL and the FLSA may not recover liquidated damages under both statutes for the same violations. See Chowdhury v. Hamza Express Food Corp., 2016 U.S. App. LEXIS 21870 (2d Cir. Dec. 7, 2016). In Chowdhury, the plaintiff brought an action for failure to pay overtime wages pursuant to the FLSA and NYLL. He was ultimately successful and subsequently awarded approximately $20,000 in unpaid overtime wages. Under both the FLSA and the NYLL, successful plaintiffs can recover not only the wages that are owed to them, but are also entitled to liquidated damages in an amount equal to the wages owed to them. Specifically, the FLSA entitles successful plaintiffs to liquidated damages in an amount equal to 100% of unpaid wages, unless the employer demonstrates “that the act or omission giving rise to such action was in good faith” and that the employer “had reasonable grounds for believing that [such] act or omission was not a violation of the [FLSA].” 29 U.S.C. § 260. Similarly, the NYLL entitles successful plaintiffs to liquidated damages in an amount equal to 100% of unpaid wages, “unless the employer proves a good faith basis to believe that its underpayment of wages was in compliance with the law.” N.Y. Lab. Law § 198. In Chowdhury, the plaintiff sought liquidated damages under both statutes (100% under the FLSA and 100% under the NYLL). 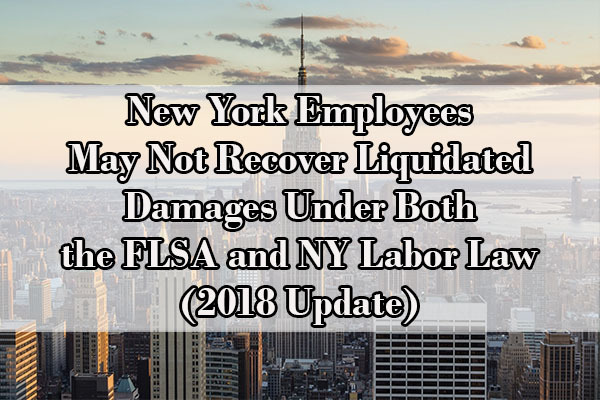 The court, therefore held that because “the NYLL and FLSA liquidated damages provisions are identical in all material respects, serve the same functions, and redress the same injuries,” plaintiffs may not recover liquidated damages under both the FLSA and the NYLL. On April 6, 2018, in Rana v. Islam, 887 F.3d 118, 122-23 (2d Cir. 2018), the Second Circuit Court of Appeals reaffirmed this principle and found that, “[w]hile the wording of the FLSA and NYLL liquidated damages provisions are not identical, there are no meaningful differences, and both are designed to deter wage-and-hour violations in a manner calculated to compensate the party harmed. We therefore interpret the NYLL and FLSA as not allowing duplicative liquidated damages for the same course of conduct. Double recovery is generally disfavored and it is clear that the New York State legislature rewrote its liquidated damages provision to cover the same ground as the FLSA. Given the background assumption disfavoring double recovery, we conclude that if the New York State Legislature intended to provide multiple recoveries, it would have done so expressly.” Id. (internal citations and quotation marks omitted). If you believe that your employer is violating the FLSA or the NYLL by not properly compensating you, it’s important to speak with a New York City wage and hour attorney to properly assess and determine all of your legal rights. 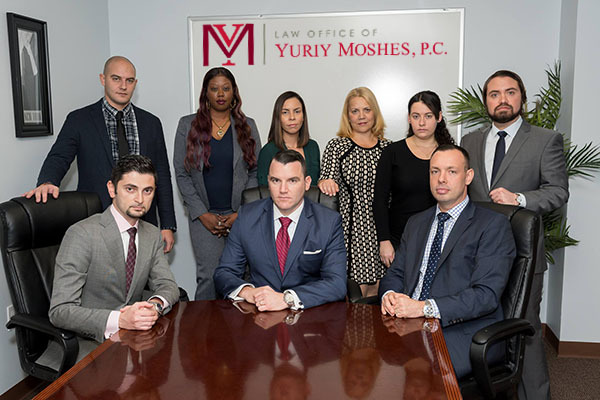 Wage lawyers at The Law Office of Yuriy Moshes, P.C. can help you collect the unpaid wages to which you are entitled under the law. We represent clients in the greater New York City area including all of its boroughs (Manhattan, Brooklyn, Queens, the Bronx, and Staten Island) as well as Northern New Jersey, Long Island, and upstate New York.